It is often tempting (though less so these days) to think of ‘Reality’ as something of a surface, both concealing and transmitting unacknowledged thoughts, feelings and behaviours; not always a truth but a partial truth that can be used and depended upon as a safety net which rescues from the complexities of self-awareness that almost always stretches beyond the acknowledged real. “We don’t have bodies, we are bodies,” cry modern preachers of a certain sort of rationalism that supposedly tries to make a claim on that Real, desperate to separate it from the ephemeral effects of a messy subjectivity. To imagine you are anything more than the joint frustrations of your own hunger, exhaustion, and or sexual drive is to indulge in the worst sort of desperation for self-importance that leads to all sorts of sins; sins like the desire for a God, or worse, a spiritual peace, or even worse – Baudelaire-esque passions! However, artists such as Francis Bacon have preempted this fashion (that has come and gone many times before) and turn it on itself, working with the Real inside the subject, that is Reality as if it is a function of human experience and that exists inside the transcendental correlation. “We don’t have bodies, we include our bodies” might be another way of looking at his remarkable ability to take a well-known image and reimagine it from another part of our essential selves. Bacon’s screaming Pope’s were his obsession because of Diego Velázquez first vision that revealed the Pope in all his glory with a subtle and usually hidden humanity rising to a surface. Bacon obliterates the idea of a ‘surface’, instead including the screaming Pope (as well as the image of the battered nurse from Battleship Potemkin) not as an easily categorised sermon on the lies of the Church, the fallacy of spiritual leadership, or even on the church’s role in refusing his sort of sexuality. He paints it defying categorisation deliberately, as if the original painting was merely incomplete without his image. His works step forward to complete a narrative, and it is in this enormity that he finds his voice. Reality then, is not a surface, nor is it a truth, it is merely another aspect of the human condition. In fact, Gerry Roost looks uncannily like Francis Bacon, and has studied his life and the few images and films we have carefully so that he embodies the artist remarkably well. Bacon is all his own contradictions, at once compelling and beautiful, equally revolting and ugly; sharp-witted and intellectually free while facile and seeking flattery. Bacon smolders with his ideas and his being, always a throbbing counterpart to his terrifying paintings that can seem more like a mirror image than a photograph. He always painted from photographs and it’s a secret fantasy of mine that he might have been too frightened of people to exist alone in a small enclosed studio with them long enough to paint them. 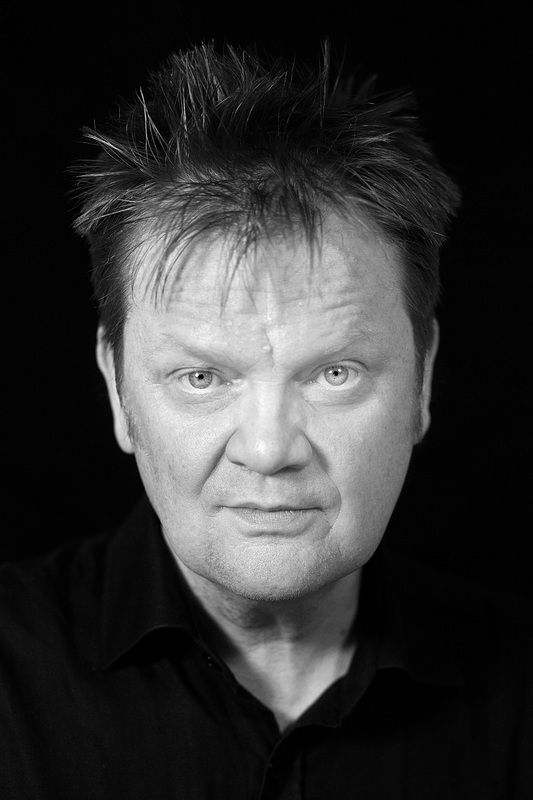 Gerry Roost has researched, devoured and internalised Bacon, even to the point of befriending Eddie Gray, a close friend of Francis Bacon’s who subsequently agreed to write some music for the show. Pope Head – The Secret Life of Francis Bacon is a labour of intense love that neither swerves from its faithful adherence to subject, nor does it dip into a sycophantic one-eyed caricature that Bacon himself would have hated. 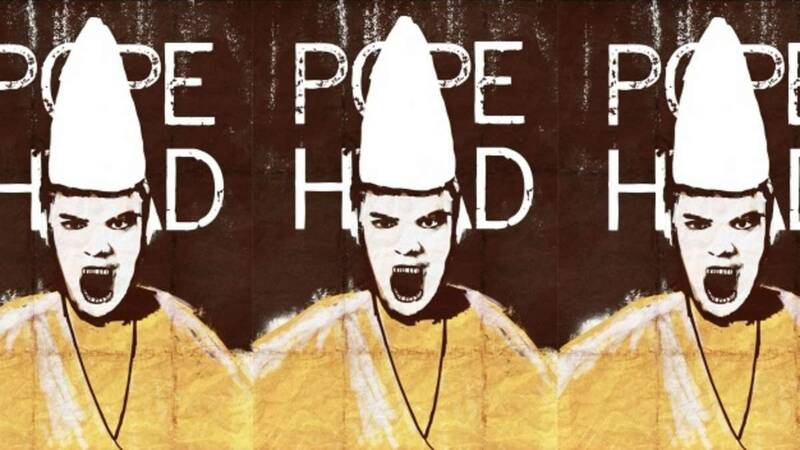 As a supplement to this years Mardi Gras season, Pope Head is exactly the kind of show that was missing. It has a passionate love for Bacon, while including his sexually alive bohemian nature that is in no way dressed up or disguised in contemporary sexual politics for the sake of hetro dominated theatre audiences. Roost’s energetic portrayal fills the hour and the direction by Paul Garnault sees Roost make full use of the stage as the full length triptych banners strongly evoke a fecund world of vibrant art. Pope Head – the Secret Life of Francis Bacon becomes one of the not-to-be-missed shows of the Mardi Gras season, imported for our great pleasure by THÉÂTRE EXCENTRIQUE. One gets the strong feeling from Pope Head that if we cling too much to the notion of ‘truth’ and ‘real’ there might be a great deal we are missing out on.